The Hipshot Tremsetter greatly improves guitar performance by stabilizing your tremolo. It automatically returns your full-floating tremolo to its exact "zero" neutral position, eliminating flutter and sag, so your guitar remains in tune. With the Tremsetter you can bend strings, play bridge harmonics, aggressive rhythm parts or mute strings, and the bridge remains stable. Best of all, the Tremsetter is total retro-fit. No need to chop up your vintage axe, just install it and play! 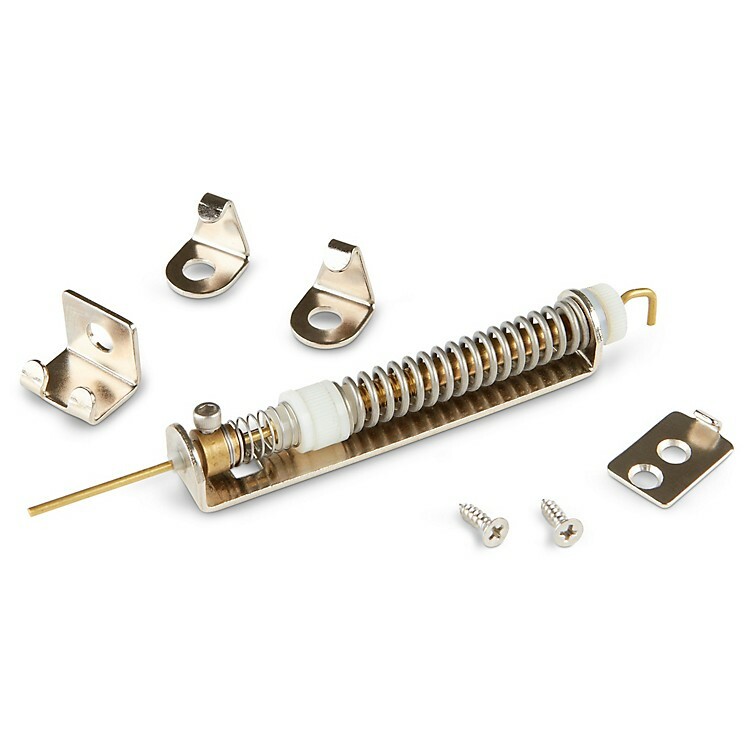 The Tremsetter installs on your tremolo guitar in the back cavity where the springs are. When you put the cover plate back on your guitar you will never even know the Tremsetter is there doing it's job. The Tremsetter automatically brings your guitar back to its "zero" or starting position. Ordinarily, your tremolo relies on string tension pulling against the springs in the back of your guitar. It's a delicate balance similar to the way a teeter totter works. If one side is just a little out of balance, your guitar will be out of tune. The Tremsetter overrides this precarious balancing situation and brings your tremolo back to the exact "in-tune" position. You can still push down and pull back on the tremolo to raise and lower my stings. The Tremsetter works very similarly to a double hinged door; i.e., the door can swing both ways, but comes to rest in the center position. When you let go or your tremolo arm after you have raised or lowered your strings, the Tremsetter automatically returns your tremolo to it's "zero" position. The Tremsetter works on Floyd Rose equipped guitars, and will work on just about any style of fulcrum tremolo including Fender, Wilkinson, Kahler, and Ibanez. The Tremsetter stabilizes your tremolo and eliminates annoying flutter. The flutter or warbling sound is really your string energy being absorbed by your tremolo springs. The Tremsetter lightly holds your tremolo in position so that your string's energy goes through your pickups and out your amp, not into your tremolo springs. You should immediately hear a dramatic improvement in your guitar's attack, volume, and sustain. The Tremsetter stabilizes your tremolo to minimize "tremolo sag". "Tremolo sag" is what you experience when you bend a string, increasing the string pressure causing your tremolo to rock or sag forward. This puts your adjacent strings out of tune. This is especially annoying when you are trying to play country or blues style double stop bends. Also, when your tremolo sags forward, you have to bend farther to raise the pitch of your strings. With Tremsetter, you will immediately notice that your strings feel tighter and less rubbery. The string tension of a tremolo guitar in large part is determined by the tremolo springs located in the back of the guitar. When you bend your strings what you are really feeling are the springs stretching out. Once the Tremsetter is installed, your tremolo will be stabilized and you will feel the true string tension. The Tremsetter will give you all the advantages of a fixed bridge guitar while maintaining the versatility of a full floating tremolo instrument. Dive-bomb without the tuning nightmares! Order today.